Pressure regulators have the shutter (spear valve) that helps the adjusting spring by creating a significant load loss. Equipped with a compensation system that stabilizes its operation, the pressure regulators for water available in the GNALI BOCIA catalogues enable a precise and consistent regulation of the output pressure even in the presence of far-reaching variations in input pressure. That makes of them important tools for safeguarding devices connected at source. The compensated seat of these pressure regulators is the component that makes the difference by contrasting, proportionately to the flow rate demanded by users, the force of the adjusting membrane and by lightening the work of the control spring. 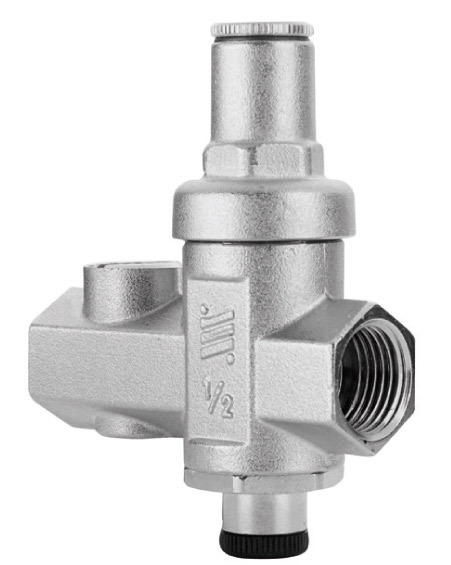 The product is manufactured starting from a semi-finished material forged in CW617N that is then processed on latest generation transfer machines, in order to obtain the body of pressure regulators with extreme precision and ensure that everything runs smoothly. The process of manufacturing pressure regulators is controlled in accordance with the ISO9001 standard that ensures quality and reiteration of results. Every item is then calibrated at the bench and supplied to the customer along with the accompanying certificate.